Unfortunately, do to life, I have a ton of ideas that run thru my head, but I haven't been able to actually create all of the them. One of these ideas for some time has been to make my own thin gauge sheet metal press brake. Honestly, it's not that hard of a concept to concieve, or even put into application. Still, not having a good work bench, nor a work shop, makes things difficult for me. It's hard to have to find space to store one more piece of equipment. It's for this very reason, I work with the most basic of tools. However, if you've got the space, need the press break, are willing to put a few dollars and little time into building one, this video may give you a good starting point for your tool fab project. Don't forget... These press breaks aren't just good for sign guys, hvac guys, or tin guys. A thin gauge break like this can be the perfect fabrication tool for any slew of projects. Everything from buggy body panels, template panels, trailer walls, center consoles, and the list goes on. So, take a moment and see how simple and cheap it can be to have a tool that truly works for you and your needs. 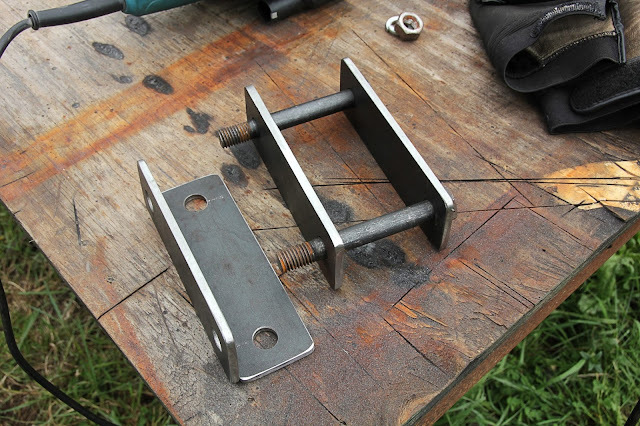 This is a very simple and cheap option for a thin gauge sheet press break. This press break is capable of bending thicker and stiffer materials such as stainless sheet, but it requires quite a bit more fabricating to build it. Note: Press break fabrication in this video is only until around 5:00 min. After the first 5 min or so, they go on to showing the making of a stainless steel bbq. Also, the english isn't perfect, but pretty clear. Another effective and even slightly more complex DIY press break. So, which will you choose to copy? Let me know in the comments below.